Melissa Wright, of course, wishes there didn’t have to be a special mass for her son, Michael. It’s safe to say that just prior to Dec. 2, the mother of two wasn’t expecting to attend a fundraiser for him at St. Peter’s Church a little less than a year after taking in his Ring Day ceremony there. But she was indeed at St. Peter’s Church Saturday, along with her husband, Michael Sr., and younger son, Vincent, to support her first born like she’s never done before. Michael Wright had suffered a serious injury … he broke two vertebrae … while taking part in the 12th annual Polar Plunge on that early December day and had recently been discharged from the Kessler Institute for Rehabilitation (N.J.) after a lengthy stay. “A parent’s worst nightmare that I want to forget,” was the way Melissa put it while the fundraiser took place. “But I have a lot to be thankful for … the prayers, the love, the visits, the way people have reached out to us during this trying time. And there was, yet, another positive sign for the 17-year-old on Saturday. The St. Peter’s student planned to attend the mass, but miss the fundraiser, which took place at the conclusion of the service. But Michael, who is a member of the Eagles’ football and swimming teams, was feeling pretty good at the conclusion of mass. 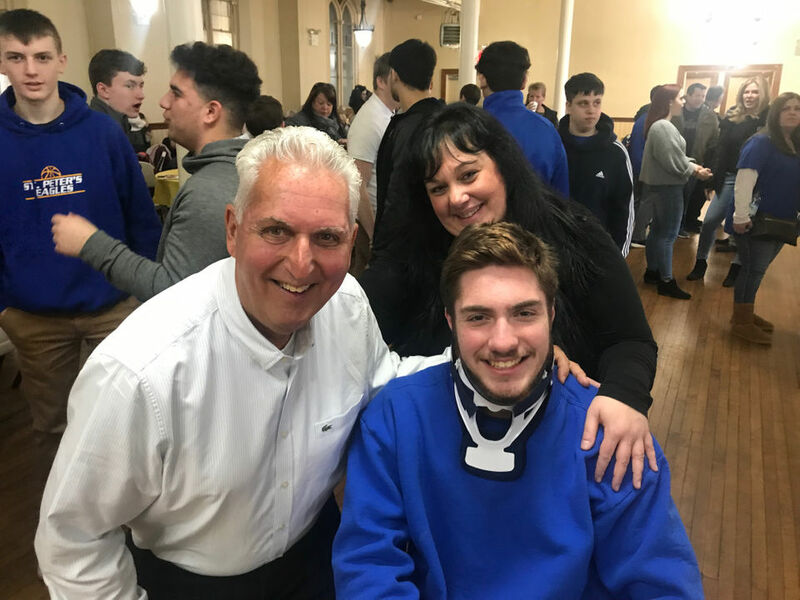 And despite wearing a neck brace and needing a cane, he went down a staircase under his own power to pay a visit to Farrell Hall for the fundraiser that was attended by school officials, teachers, fellow students, alumni and many others. 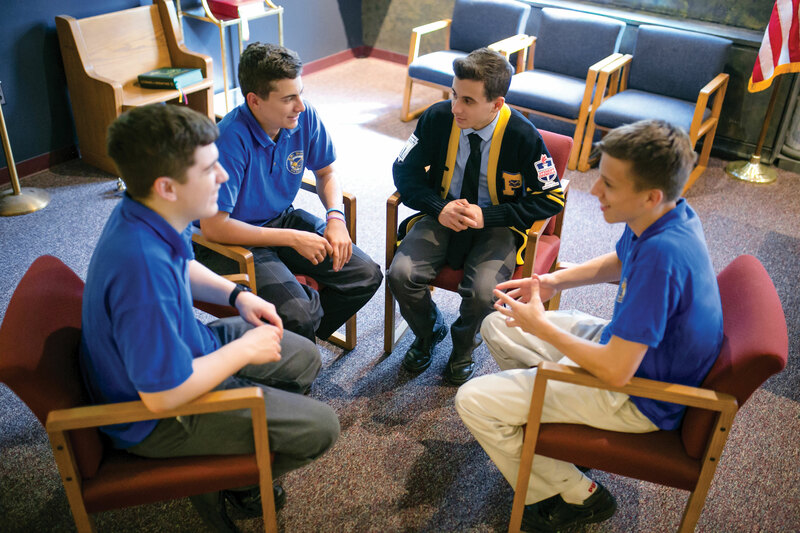 “I can’t thank (Manresa Grand Knight) Eddie (Thatcher), the Knights of Columbus, and (St. Peter’s Director of Alumni Development) Jack (Muraca) enough for organizing the fundraiser,” said Melissa Wright, noting that St. Peter’s pastor, the Rev. Michael Cichon, has visited her son every other day. “And we’re thankful to everyone who attended and helped in one way or another. Melissa knows her son still has a long road to travel for complete recovery, but ever since the conclusion of his initial surgery immediately after the accident (he had movements in his arms, legs and hands just 25 minutes after surgery ended), he’s made tremendous strides. “I’m so pleased, there’s been so many positive signs in a short period of time,” said Melissa, noting doctors initially said Michael’s rehab would be anywhere from six months to a year. “There’s a lot of situations at Kessler that don’t turn out the way Michael’s has. “But (Kessler’s doctors) told us his positive attitude has helped other patients in various ways,” she added. “And I’ve heard so many stories from other parents that I didn’t even know about my son.